Do you know how much money your facility spends annually for purchased energy and utility equipment maintenance? Is it $2 million, $5 million, $10 million? Would reducing those costs by 5 or 10 percent interest you? This article offers unique ideas about how to effectively reduce site energy and utility costs in these times of limited resources and frozen budgets. Energy management is not a new concept. The United States has gone through several supply shortages and price spikes since the 1970s. Accordingly, many large companies implemented energy programs and reduced their costs significantly. In the past 8 years, though, energy costs have again increased 30 to 50 percent (even more in some regions). Energy has become a major part of indirect operating expenses, compared to earlier times when it accounted for just 5 to 8 percent of the operating budget. This trend is expected to continue, on average, increasing 2 or 3 percent per year for the next several years. Environmental and energy advocates tell us the United States must move away from carbon-based energy sources—coal, oil, and gas—to effectively manage budgets, mitigate environmental challenges, and sustain our standard of living; yet 45 percent of our energy is provided by coal and 28 percent by oil and gas. It could take 30 years to displace many of the nation’s aging coal-fired utility power stations—the major source of CO2, NOX, and SO2 pollution. All the while, the Organization of the Petroleum Exporting Countries (OPEC) continues to control energy prices by manipulating global oil supply. The United States must become more energy independent and carbon-free. As 4 percent of the world population, we consume 26 percent of the energy, a proportion that is growing each year. Commercial and industrial facilities that consume large amounts of energy need to concentrate on demand-side issues. For energy and utility systems, it is rather straightforward: The manager in the corner office should have demand-side energy conservation as a measurable performance objective (i.e., pay is partially based on a continued energy and environmental improvement program). This helps incentivize the organization to commit its scarce resources. Energy and utility equipment challenges have increased for many facilities, partly due to corporate short-term operational strategies, cost reduction programs, and reduction-in-force policies brought about by conflicting political, environmental, and financial policies. High wages and benefits in the United States have affected our competitiveness in the world economy. To compensate, companies have automated and eliminated jobs, or relocated offshore. Utility equipment in some mature facilities has fallen in need of rebuild or upgrade. The U.S. Department of Energy (DOE) reports that declining maintenance services, poor equipment reliability, and the need for employee training are among the most frequently identified causes of energy waste. Are you keeping abreast of technological changes, new products in the energy industry, and the operational integrity of your equipment? The number of companies selling energy management services these days is staggering. Every week we hear another energy-strategy buzzword: carbon footprint, sustainability, “green” buildings, LEED, stimulus funds, buy versus save, cap and trade, etc. Perhaps U.S. commerce and industry should look inward and reduce their carbon-based energy appetite rather than accept market manipulation and federal oversight. Rather than spending time trying to package sound energy conservation issues into a new, more palatable management concept, focus on education. Energy conservation is a well-established industry, and energy programs have been well documented since the early 1980s. Information is readily available on the Internet—start by trying some of these programs. The DOE has a list of the 100 most often identified energy conservation measures on its website. For mature operating facilities, it just takes a trained eye to review some energy data, check over the DOE list, and conduct a brief assessment. Then, prioritize and get busy. Or you can hire a Certified Insulation Energy Appriaiser for a complete audit. The new carbon-free technologies (e.g., wind, solar, geo-thermal) will not pass economic muster in most for-profit companies over the short term. Companies should be careful about considering huge energy projects. In these slow economic times, big capital projects are few and far between. Moreover, if a facility was built after 2000, new ASHRAE/DOE building codes should have resulted in energy efficiency, and many of the newer conservation measures (such as efficient motors and controls upgrade) may not apply. Mature facilities may need to get back to the basics—e.g., operational reliability, operator training—and evaluate some of the new products with excellent returns, such as insulation upgrades. One approach used successfully in the 1970s was to require personnel to have 1 of every 10 issues on their project list be an energy conservation item—even a small one. In today’s environment, 2 of every 10 items may be a better plan. Facilities need to commit to continuous improvement. Demand-side energy conservation is everyone’s job. We must modify wasteful habits developed in the 1960s and ’70s “throw-away” society, when energy was bountiful and cheap. Do you leave the lights and TV on at home when you leave the house? The same conservative logic should apply throughout an organization. The job needs to be approached rationally. Staff should key in on the boss’ priorities—and cost control is Number One. How can Btus be turned into dollars? There are usually a few “low-hanging fruit” energy savings and utility improvement items that can be implemented without project managers, consultants, and major capital initiatives. A few successful small projects will gain some credibility. With 10¢ power and $7 fuel, there are several issues around the facility that should have lower than a 2-year return on investment (ROI), including boiler efficiency, insulation work, leak repairs, and new controls. These are some of the same items from the 1980s, but the difference now is that engineering and maintenance staff are no longer available to handle many routine improvements. With downsizing, operational reliability has begun to slip. Left unattended, equipment and systems will degrade in performance. Experienced help may be needed. Numerous contractors specialize in energy systems improvements. Management will need to communicate with employees, ask for their assistance, and get them involved. One idea is to organize an informal Energy Awareness “Alpha Team” to meet at lunch and generate ideas. Outstanding contributions can be rewarded with tickets to a community activity or a U.S. Savings Bond. There must be environmentally conscious folks in the organization. Some may even have noticed an excessive number of compressed air leaks or workers leaving office lights on at lunchtime. A few may volunteer to be on an Alpha Team if management makes a firm commitment and pays for the sandwiches and chips. The adage that one cannot “eat an elephant in one sitting” is relevant here. Small and continuous progress will sustain employee interest, produce good results, and please the management team. For larger projects, a lack of technical resources should not be a reason to do nothing. Get some help to lead the program if needed. Proven energy projects and utility equipment optimization can bring more profit than selling an equal amount of a company’s products. The challenge is to identify these opportunities. The extent of resource commitment can be easily estimated. Energy and utility costs are usually summarized in a section of the financial monthly closing statement. It takes only a few minutes to compare energy costs to total manufacturing or operating costs. Energy may be 60 to 80 percent of the maintenance and utilities budget. It also may be 25 to 40 percent of the site’s overall operating budget. If these benchmark comparisons are known, it is easier to determine potential savings and extrapolate a reasonable level of resource commitment. 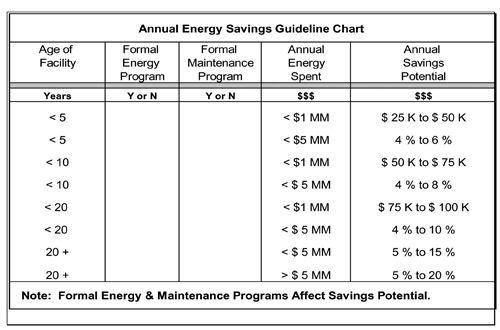 Figure 1 can be used to estimate a facility’s potential savings. For smaller facilities, $50,000 to $100,000 savings can justify a limited resource commitment. For larger operations, $500,000 to $1,000,000 of annual savings would be a major success. Again, management must be committed, employees should be including energy awareness in their daily activities, and those with exceptional ideas should be rewarded. A 5-percent employee participation rate is typical. The tried-and-true energy projects of yesteryear are still good ideas today: insulation; boiler efficiency; compressed air systems; pipe and duct insulation; steam and air leaks; electric demand control; efficient motors; Variable Speed Drives; lighting upgrades; Heating, Ventilating, and Air Conditioning (HVAC) optimization; synthetic lube; belt drives; and pumps and fans. Many of these will produce excellent results (less than 2-year ROI) with today’s higher energy supply costs. In regions where power costs are 12¢ to 18¢, many electrical projects can produce an ROI of less than 1 year. For facilities with fuel costs of $7 to $9, boiler efficiency and insulation improvements produce an ROI of 6 to 24 months. Any process that operates above 250°F should have the insulation inspected annually. An inexpensive ($250) infrared gun can be used to conduct a brief survey. If surface temperatures exceed 130°F, then repairs are in order. A list of repairs should be developed, and an insulation contractor should handle the work. There should be NO poorly insulated steam or condensate piping, valves, or fittings in the facility. The same goes for gas and electric heated process system ducting and pressure blower piping. In air-conditioned bays, the savings can be double. Energy Policy: Is there a published energy plan and objectives? Identified Sponsor: Is someone designated as the energy coordinator? Energy Bills: Are bills reviewed by a technical person (not just the Accounting Department)? Accountability: Is management held accountable (energy cost control is one of their personal objectives)? Ongoing Repair Work: Do facilities personnel have an active repair program for leaks, insulation, air filters, steam traps, lighting, etc.? HVAC, Lighting, and Office Equipment: Is there a published policy for how this equipment is operated and controlled? Data Monitoring and Reporting: Are costs and usages reported regularly—quarterly at minimum—to technical personnel for review and critique? Employee Involvement: Is there a newsletter or program that encourages employees to help and rewards exceptional ideas? Have their training needs been investigated? Getting started requires old-fashioned legwork: Facility personnel need to get help from a trained eye and dig in. Within a few months, a culture shift may begin to occur—you could be pleasantly surprised. This more casual approach should produce some excellent results, and a more formal energy program can be implemented later. One note of caution: One must be sensitive to “turf” issues with those responsible for facility systems and the energy program. A good approach may be offering to help economically justify some of their backlogged energy projects.